A delegation from the Ukrainian Ministry of Defense, headed by Deputy Minister Igor Pavlovski, is on a working visit to the Republic of Moldova during February 11-12. 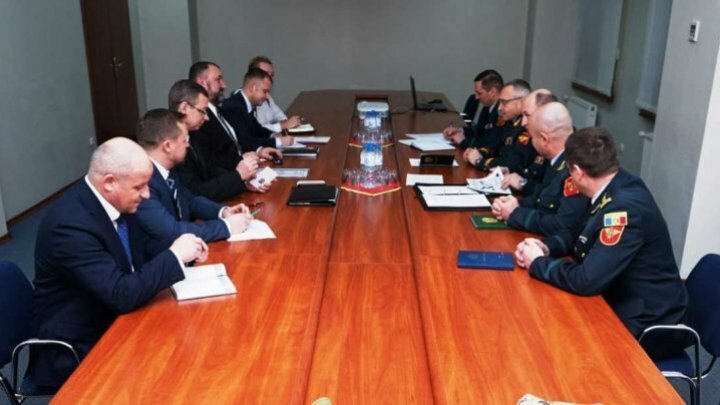 In Chisinau, the Ukrainian delegation met with officials of the Ministry of Defense - General Secretary of State Radu Burduja, State Secretary Vladimir Iliev, and Commander of the National Army Brigadier General Igor Cutie. The officials addressed subjects of common interest including the current stage of bilateral military cooperation. The sides also discussed the situation in the Transnistrian region, the security issues facing Eastern Europe, as well as the defense reform in the two countries, focusing on army professionalization, military training and joint participation in bilateral exercises and multinationals. The officials agreed on intensifying the cooperation between the defense institutions of the Republic of Moldova and Ukraine, through joint programs and projects, including the defense industry, to contribute to the modernization of both armies. The agenda of the Ukrainian delegation included visits to some military units of the National Army of the Chisinau garrison, in order to document the specifics of their activity.